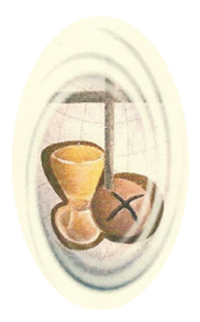 Through the eucharistic presence and holy communion. your servants, Peter Julian Eymard and Marguerite Guillot. By their lives of love and sacrifice they followed you to the Cross. Marguerite Guillot was the sixth child of a Lyons tailor. Even at a young age she was always longing for "something more" on her spiritual journey. 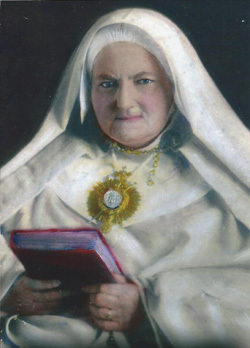 This desire for spiritual growth led her to work with Father Eymard in developing the Third Order of Mary in Lyons and eventually to establish a work to honor the Holy Eucharist in Paris, the foundation of the Congregation of the Servants of the Blessed Sacrament. "As to the women, we want to form true adorers for our Eucharistic Lord modeled on Our Lady of the Cenacle. We will assemble all those whom Jesus will choose.. When all is ready we will consult God about the place where he wants his new Cenacle." Mother Marguerite outlived Father Eymard for 17 years. During that time she oversaw the Church's official approval of the Congregation and its constitutions. Under her direction, our first chapel was built in Angers France. These accomplishments were realised in spite of her physical infirmities, eventual blindness and stark poverty. "May this dear congregation be like a censer whose incense continually rises and descends: rises by the prayer we offer for ourselves and the whole world and which descends upon us with heavenly graces and blessings." At the time of her death, 60 sisters were located in three convents. Her life is a model of love for Christ, of strength and prayer, in the midst of great suffering. Her generous self-sacrifice, fueled the fire of love. "I live now, not I, but Christ lives in me." "Let your prayer be universal and embrace the whole world."